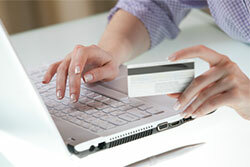 The benefits of opening an online bank account are well documented. For example, online banks typically offer higher interest rates than local financial institutions. This is attractive to many people, especially to those who are stocking away a lot of money and are, therefore, looking to earn as much as possible. On the downside, the impersonal nature of online banking scares many away. While this is a valid concern, there are several tips you can follow to stay personally connected to your institution of choice – even if it is online. If you have a question or just want to make sure everything is okay with your account, contact your bank’s customer service team via phone. Don’t waste time with email and other online methods. Instead, use the telephone so you can have a personalized conversation with a live body. A phone conversation alone can go a long way in easing the tension and allowing you to realize that there are “real” people working to keep your money safe. For whatever reason, many who rely on online banking are afraid that their money will one day disappear from their account. If you have any fear, ease your mind by reviewing your account on a regular basis. That way, if you see any suspicious activity, you can immediately contact the bank for an explanation. Before you opened your account, did you search for the bank that offered the highest interest rate? If so, you are not alone. This is how many people choose a financial institution. While there is nothing wrong with wanting to earn as much money as possible in interest, you may have overlooked other aspects of the bank that are just as important. Do you know where the headquarters of the bank is located? Are you aware of the many features available to you through your online account? Have you taken the time to learn about the bank’s security features? Answers to these questions will help you have confidence in your bank, even if you never step foot in a physical branch location. Unlike a local branch where you can walk in and speak with a bank representative, an online financial institution is an entirely different experience. You will never see anyone in person. That said, you don’t have to feel “out of touch” with your money. Follow the tips above to personalize your online banking experience. Online banks are pretty new, and you are right to point out there can be some advantages. But, you’ve given some great ways to stay connected. Loosing that face time with your banker can be hard for some, but the more you know the less troubling it can be. Thanks for the information! Well post. it is require to get in touch always with online banks. also it needs to know everything properly about bank and its services before opening account. thanks for your useful information. Online financial institutions are fairly new, and you are right to indicate there can be some benefits. But, you’ve given some efficient methods to keep in touch. Well publish. it is need to get in contact always with on the internet financial institutions. also it needs to know everything effectively about financial institution and its solutions before starting consideration. thanks for your useful details.